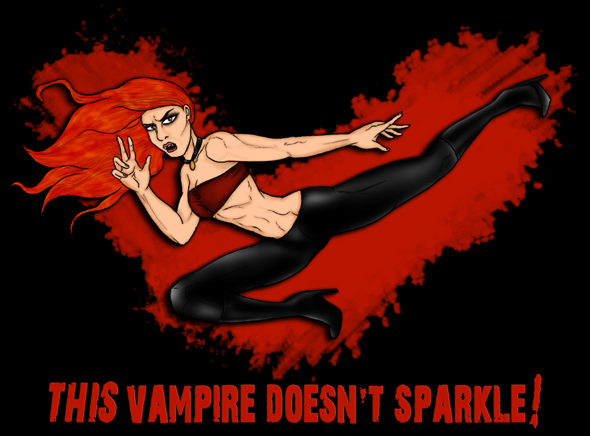 Taversia, author and artist for the Vampire webcomic Wayward Fall, takes the hot seat. Q1. What’s your webcomic ‘Wayward Fall’ about? A1. Over the course of the past couple of years that Wayward Fall has been online, its storyline has continued to unravel and evolve. I first began the comic with my co-writer, AntiType, in Autumn/Winter of 2008 (it was a transitional period; the first pages were created on Black Friday, the day after Thanksgiving. But the comic itself did not go live until December 17th). It centres around a vampire, Vigana, who grew up in the Dark Ages, now reawakened in the modern era, in an urban underground society. She fell in with the mob, operating the fictitious city of Wayward Falls, and soon came in to working for them as a hit-woman. It outlines her inner struggles, coming to terms with the trials and tribulations of her rather unfortunate life. Although there are many comedic elements within the comic, at its core, Wayward Fall is an ongoing romantic tragedy with a strong fantasy/sci-fi theme. There are also subtle religious undertones abound. As the story continues to develop, it will gradually become much darker. Furthermore, not any one character is safe from at some point, facing destruction at the discretion of the writers (currently, just me). Q2. Is it true that Wayward Fall is based on Live-Action Role-Play? If so, what system, and do you still play? A2. Yes, the comic is based on the role-play, and loosely followed the game plotline as well. It has since branched off in a new direction however, and though there is still some close association with the LARP, it has become a story all on its own. Anything that now happens in the game does not affect the comic, and vice-versa. It merely served as a template in the beginning. As for the game itself, we run on a tweaked White Wolf system with no vampiric bloodlines. We continue to gather once a month, and resort to text-based role-play in between games for continual character & plot development. 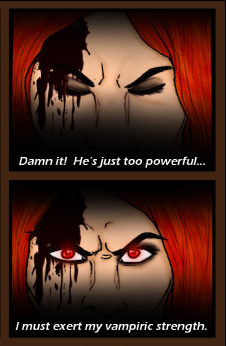 The forums on the comic website are actually in conjunction with the game, and many of the role-play interactions between players can be found there. Non-players are able to join us, if they so choose! Players get extra experience points for any interactions that occur in between games, so those who don’t play but wish to role-play for its own sake actually help us progress along with our characters! On that note, I should also mention that the next chapter of Wayward Fall (Act II: Part III) will be entirely live-action; real actors playing the parts of the comic characters! It should make for an interesting change of pace. Q3. Do you think Role-Play is a good tool for writers? A3. Absolutely! Little else gets the imagination flowing as some outside stimulation from like-minded people. It builds a strong foundation for your characters, and gives you a good ‘feel’ for how they would respond differently to certain situations. It is particularly useful for crossover works, as well. Wayward Fall has completed three different completely canon crossovers thus far. To stay true to the characters involved, a fair bit of role-playing went a long way. Q4. How did you become involved with so many cross-overs? Do you have any tips (now you are oh so experienced) on managing them successfully? A4. I first contacted Patricia Lupien about her webcomic, ‘Swiftriver’, after reading a good bit into the storyline. I noticed a lot of parallels and similarities; the fantasy theme.. the modern urban setting.. It just made so much sense to me to reach out to her and ask about the possibility of doing a completely canon crossover between our storylines; a side-story, where both our main characters team up with one another. From there, I became kinda hooked. I absolutely LOVE collaborating. Wayward Fall has since collaborated with ‘Lovefeast’, by Senshuu, and ‘Cetiya’, by Mitsukaiten as well. Actually, as it turns out, Mitsukaiten resides an hour’s walk from my house. Small world, huh?? We met for coffee at a local coffee shop and discussed the details of our crossover in person! That being said, communication is key; ironing out every last detail, from dialogue to panel. You need to have good creative chemistry with the person you are working with. That’s the only thing I can really say, in the way of “tips” I could give. I honestly just throw myself at people! “DO THIS WITH ME, OK?” <3 =D If I’m lucky, they will be receptive~! Q5. Are you modelling for Vigana in the Live-Action version of Wayward Fall? A5. Yes, actually! I have put together an accurate ensemble, based on outfits Vigana has been seen wearing at different points in the comic. I actually just got done with the first shooting for the live-action chapter, and it was a great success; but very physically demanding! In one of the fight scenes, I had to take a fall and I had two battle Katars sheathed, resting on my hips (as Vigana does, during flashback scenes in the comic). Underneath Vigana’s battle dress I was very lucky to be wearing a corset, because when I fell, one of the Katars actually came loose and pierced through the dress, tearing a gash up the side of it. If I hadn’t been properly armoured, I’m quite certain I’d have been taking a trip to the emergency room. This is a *classic* case of comic book artiste extraordinaire turned daredevil stunt-woman~!